Before I arrive at Clairvaux, I have images of flying buttresses and towering vaults but I’m sadly disappointed. The abbey was abandoned after the French revolution and Napoleon turned the dilapidated buildings into a prison, housing 3000 inmates at its peak. A new high security wing was built in the 1970’s and these days it contains some of the most dangerous criminals in France, including Carlos the Jackal. For this reason you need to leave your passport at the gate, photographs are forbidden and watchtowers overlook your visit. It’s a grim cold place and you can still see the original “cages a poules” or chicken coop cells where prisoners were kept until the 1970’s. These are nothing more than metal cages, just large enough to hold a bed but not much else. However, they were a huge improvement on the austere monks cells in which up to 30 men were held at a time. Victor Hugo based the prison scenes in Les Miserables on what he saw when he visited in 1834. There are plans to restore the buildings and the 18th century refectory, where the monks took their meals, has been refurbished. In fact during the prison years it was used as a chapel so 3000 convicts could attend the daily service. There are now paintings on the walls, the stucco has been touched up and the panelling restored. What’s interesting is that extra tiers were added at the back so all the convicts could cram in to hear the words of God, kept in their place by a wall of wire mesh. 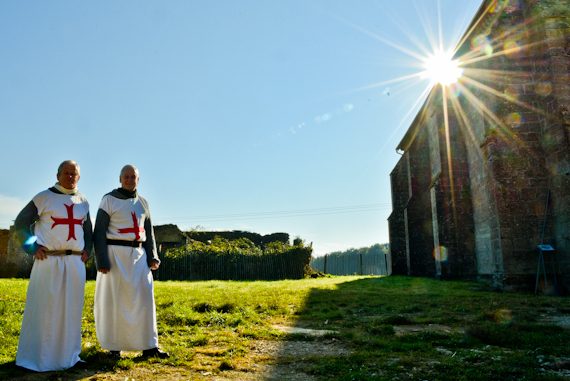 Bernard of Clairvaux also had a hand in founding the Knights Templar. In 1118 local boy Hugues de Payns decided to create an army composed of monk knights, to watch over pilgrims on their way to the Jerusalem. It was a controversial move and some members of the church hierarchy didn’t like the idea of monks with a licence to kill. Bernard gave the plan his support and the Templars were official recognised by a congress held in the great cathedral of Troyes in 1129. 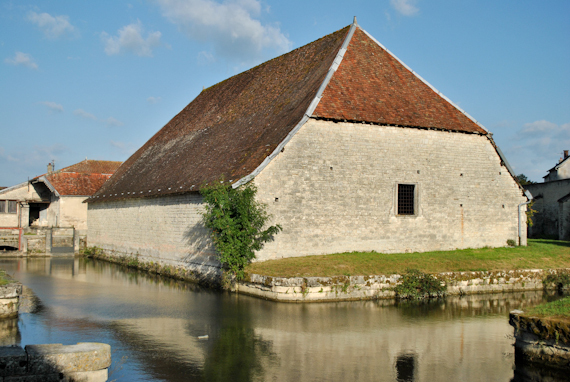 Their headquarters, long demolished, was in Troyes but they had supply stations or Commanderies scattered all over. 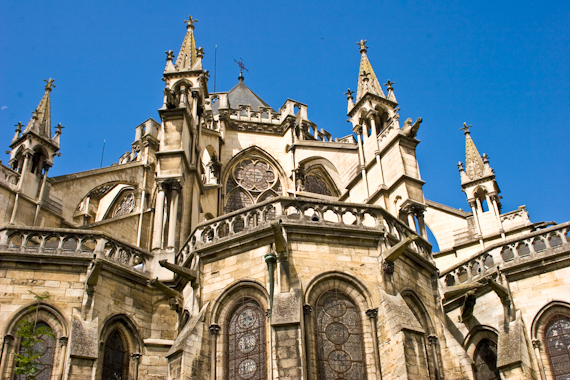 It’s possible to visit one of these, in Bar-sur-Seine not far from Clairvaux. I’m shown around the Commanderie d’Avalleur by two volunteers dressed as Templars with white robes and big red crosses on their chests. The gothic chapel is still intact, although the roof needs some work, but the main building was modified in the Renaissance. Monks worked here, nurturing crops in the extensive grounds, which they sold to finance the Templars expeditions. Clairvaux Abbey was the biggest landowner in the area and owned a number of farms, some with vineyards of Pinot Noir grapes which St Bernard brought from Burgundy. 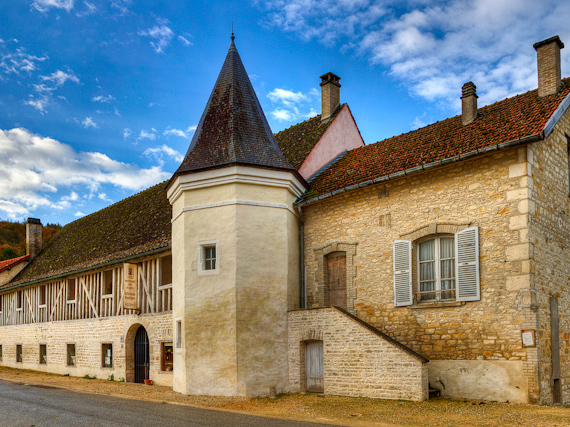 One of the smallest of these, Cellier aux Moines in Colombé-le-Sec, still keeps the tradition going, but now produces champagne in its 12th century cellars. 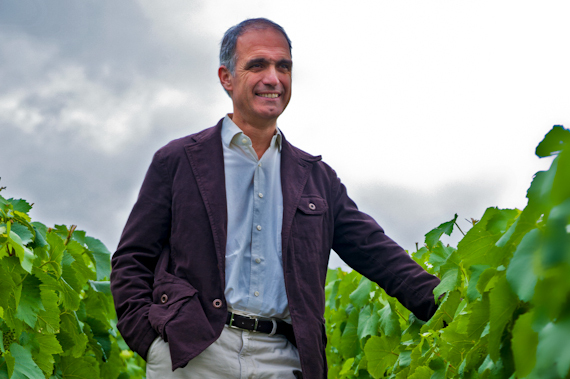 Monial is very much a boutique operation with a yearly output of only 40,000 bottles. My favourite is their Libera Me Brut, a blend of 80% Pinot Noir and 20% Chardonnay, elegantly dry with white fruit notes. 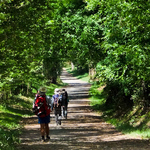 If you can’t manage to drive home, they also have a gite on site which sleeps four people. 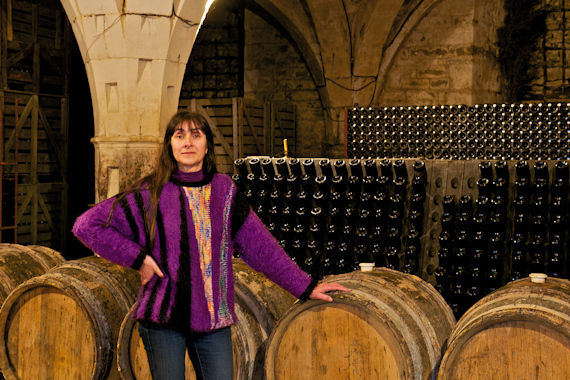 Another Clairvaux farm, but far larger, is now home to Drappier Champagne in Urville. Michel Drappier’s father started making champagne after WW2 and they now have over 100 Hectares planted with 70% Pinot, 15% Chardonnay, 13% Meunier and 2% rare varieties. 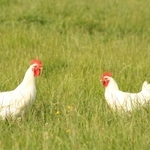 They’re 100% organic and also use biodynamic methods. In front of a warm glowing fire, watched by 91 year old Andre Drappier, I sample five of their finest tipples. I’m impressed by their Grande Sendree Brut which is grown exclusively on tiny parcels of land, burned in the village fire of 1838. It’s a blend of 55% Pinot and 45% Chardonnay and the 2008 vintage is one of their best. My last night in Troyes and the delightful medieval capital of Aube, which fortunately was undamaged by two world wars. The narrow streets, lined with brightly coloured 16th century half-timbered houses lend it a special charm, and some are so close that they almost touch. The region is famous for its stained glass but it’s often difficult to see it up close. Fortunately, in La Cité du VitrailAube, the stained glass museum, 25 pieces from the 12th to the 20th century are displayed at ground level and you can reach out and touch them. Some of the best examples are in the Cathedral, with over 1,500 square metres of dazzling glass for the sun to create kaleidoscopic patterns in its interior. This is the same place where the Knights Templars were officially approved and in the treasury is the reliquary casket of Saint Bernard and his closest friend Saint Malachy of Ireland. On the other side of the square is the Cellier Saint Pierre which has a distillery in its basement. It’s connected to the cathedral by an underground passage and apparently the monks used to come here for a secret swig. They’re still making the unique Prunelle de Troyes liqueur from the pits of sloes, and a slug of this sends me on my way. 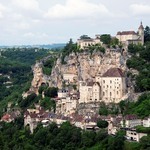 Champagne & Ardenne Tourism has information about the region. 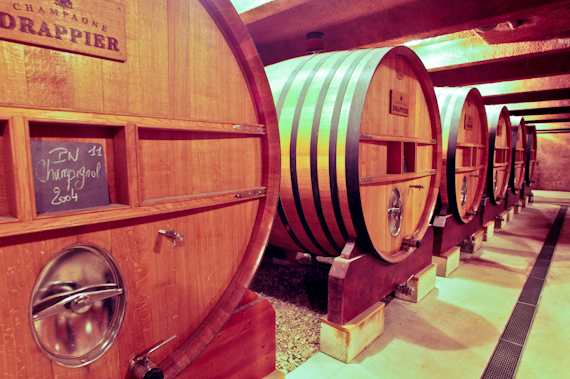 Both champagne houses, Monial and Drappier offer guided tours of their cellars and tastings. The Hotel Le Saint Nicolas makes a good base for visiting Clairvaux Abbey. 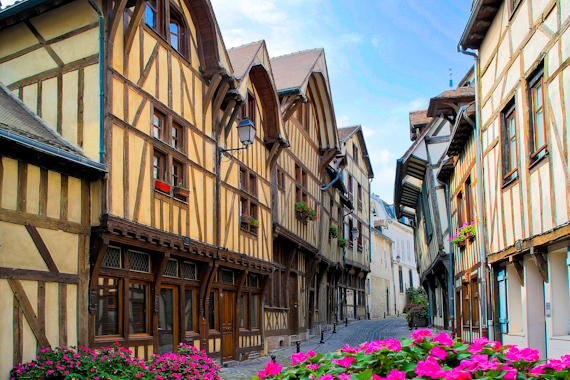 Les Comtes de Champagne Hotel occupies a traditional half-timbered house right in the centre of Troyes and has atmospheric rooms. Chez Felix is just along the street and offers local seasonable produce. Le Damier is a tasty bistro handy for the station. Le Jardin de la Cathedrale is a new luxury B&B opposite the cathedral, which opens in the summer.